For generations, the natives of Harrisport have watched wealthy summer families descend on their Cape Cod town, inhabiting the massive cottages along the town’s best stretches of beachfront. But when rich Southerner Tucker Moss breaks the heart of local girl Edie Wright in the summer of 1966, an enduring war starts between the two families that lasts for generations…. Then renovations at the Moss guest house reveal a forty-six-year-old declaration of love carved into a piece of framing—and a startling truth that will force two women and the men who love them to confront the treacherous waters of their pasts. Erika Marks, a native New Englander, has worked as an illustrator, an art director, a cake decorator, and a carpenter. She lives in Charlotte, NC. This is her third novel. For both families, the Mosses and the Wrights, the cottage holds many memories and great personal significance. In your life, has there been a place—be it one you visited only occasionally or maybe one you lived in year-round—that you remain deeply connected to? Does it still exist? If so, do you revisit it? Do you get the same sort of feelings there that you did years ago? Even though she is reeling from Hudson’s breakup, Lexi finds herself drawn to Cooper in the hours after she and Hudson part, and the memory of their time together that night lingers in her mind, even though she remains conflicted about her feelings for Cooper. It is only when she and Cooper meet again twelve years later that Lexi has the opportunity to better understand her feelings of attraction, even if she is hesitant to act on them. Have you ever felt yourself drawn to someone at a time of emotional strain and struggled to understand whether your feelings were real or just the result of a vulnerable moment? When Lexi finds Cooper’s manuscript, she accuses him of using her and insists his actions are reason enough for why they can’t further their romantic relationship. As a result, Cooper tells Lexi that she is only using the manuscript as an excuse to stop their romance because she still has unresolved anger toward Hudson and is afraid of being hurt again. Do you think Lexi is right to make such a big deal about Cooper’s writing, or do you think Cooper has a point in his assessment of Lexi’s behavior? Have you known people who put up barriers to love? The summer of 1966, when the guest house is being built, is a pivotal one for many of the characters in the novel. For Edie, she is developing feelings for Tucker while trying to understand her changing feelings for Hank. For Tucker, falling in love with Edie is the chance he has always wanted to break away from family responsibility and expectation. For Hank, the introduction of Tucker into Edie’s life has him feeling threatened and forces him to reevaluate the leanings of his own heart. Did you identify with any particular character’s evolution and personal conflicts during that time? If so, which one, and why? Owen is struggling to come to terms with his divorce and can’t fathom that his daughter, Meg, might not be the same little girl who grew up in the house he now inhabits alone. Do you think Meg shares his struggle, or do you think she has a clear understanding of her own changes? By the novel’s end, do you believe that Owen will finally move forward and accept the changes in his world? There’s no question Lexi could have found a strong photography program closer to the cape, but she chose to leave the country for two years. Do you think those closest to her—her mom, her brother, her best friend, Kim—think she picked the Royal Academy because she was running away? What do you think she hoped to gain by leaving for a fixed period of time? Even though many years had passed since her breakup with Hudson, do you think she was still looking to hide from her heartache by going away? At eighteen, Edie has two men vying for her affections, but by the end of the summer it becomes clear in her mind and heart which man she belongs with. Did you agree with her decision, or did you wish to see her with the other man? The novel features many parent/child relationships. Which of the relationships did you most identify with? If you are a parent, did you see yourself in one of the parents? As a child, do you see yourself in one of the daughters or sons? Why? 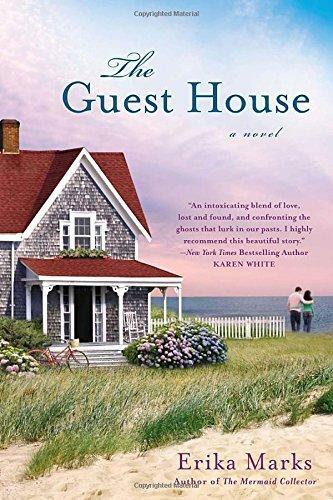 The title of the novel suggests the smaller building that initially brings the Wrights into the Moss world—but one could argue that the main house is also a guest house in that it hosts visitors too as the summer residence of the wash-ashore Moss family. Which structure do you think the title refers to? Who do you think are the “guests” in the novel, and why? One of the novel’s main themes is letting go of the past. By the story’s end, do you believe the characters will manage to do that in order to move on? Which characters do you think will be most successful and embrace their chances at new love and starting over? Which ones do you fear will struggle to succeed, and why?